Osteopetrosis is a rare condition characterized by increased bone density caused by poor or deficient bone remodeling and osteoclast impairment. There are multiple types of osteopetrosis. They may be distinguished by inheritance pattern: benign (autosomal dominant), intermediate (mild autosomal recessive), and infantile malignant osteopetrosis (autosomal recessive). The latter manifests in early childhood and has a poor prognosis. Anesthetic management of malignant infantile osteopetrosis involves the management of several risks related to clinical manifestations and complications that might contribute to increased morbidity and mortality: neurologic and hematologic complications and airway difficulty. 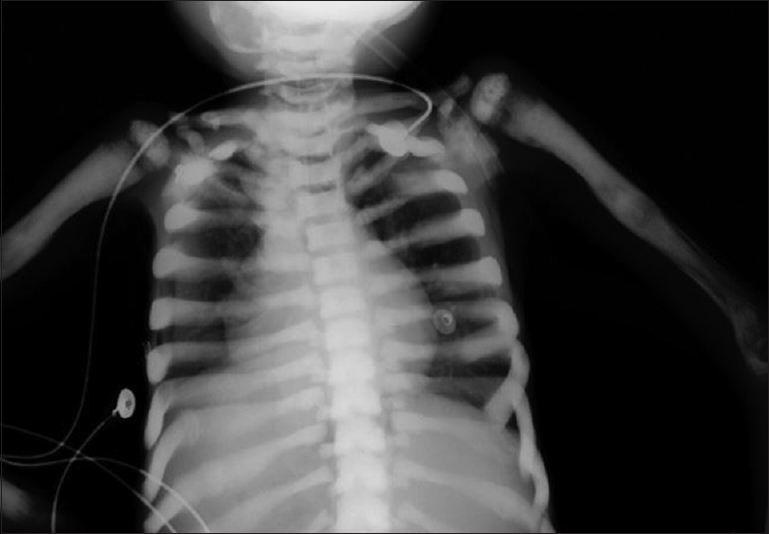 A 11-year-old boy was admitted to Pediatric Emergency Department due to respiratory failure, cyanosis, and severe bradycardia secondary to aspiration. Facial dysmorphism was obvious and he had low weight for age. Cardiopulmonary resuscitation (CPR) was started and 0.01 mg/kg intravenous adrenalin was administered. Insertion of a nasal tube was impossible and laryngoscopy was difficult because of limited mouth opening with small interincisor distance and also because there was a bone-like mass on the epiglottis obstructing the upper airway tract and bleeding on contact. The patient was intubated after several attempts using Macintosh blade and then a Miller blade by a senior consultant, but a significant bleeding was noted. Return of spontaneous circulation was achieved after 10 min of CPR. The patient was in sinus rhythm, the heart rate was 75 bpm, and the blood pressure was 75/45 mmHg. He was started on adrenalin infusion 0.2 μg/kg/min. Chest X-ray showed diffuse bone hyperdensity with fracture of the left third and fourth posterior rib arches [Figure 1]. Past medical history included malignant osteopetrosis with failure to thrive, hepatosplenomegaly, blindness, deafness, and myelopathies requiring iterative blood transfusions; stem cell transplant being in its infancy. The patient was treated for aspiration pneumonia. He developed a severe acute respiratory distress syndrome with septic shock. He died on day 6 of admission of refractory septic shock with multiple organ failure. The primary problem in all forms of osteopetrosis or “marble bone disease” is an inability to effectively resorb and remodel bone. The autosomal recessive variant or malignant infantile osteopetrosis is the most severe form with poor prognosis. Burt et al. reported that osteopetrosis increases perioperative morbidity and mortality, which are primarily related to airway and respiratory problems. Multiple factors are associated to the high frequency of difficult airway in patients with malignant osteopetrosis. They may have cranio-facial abnormalities such as proptosis, high-arched palate, broad facies, hypertelorism, frontal bossing, and mandibular hypoplasia. Oral intubation may be more difficult if the movement of temporo-mandibular joint is diminished by the presence of mandibular osteomyelitis. Nasotracheal intubation can be difficult or even impossible due to the presence of bony encroachment on the nasal turbinates. In addition to these problems, hematologic complications of osteopetrosis are common. Thrombocytopenia is associated with high risk of profuse bleeding during laryngoscopy and even following a minor trauma. Outside emergency situations, these children are still at risk of episodes of desaturation during anesthetic induction because of reduced functional residual capacity due to hepatosplenomegaly causing cephalad displacement of diaphragm. To conclude, osteopetrosis is a complex disorder that increases the risk of difficult intubation and ventilation. The malignant type has poor prognosis and is associated with various pathophysiologic changes, which make airway management even more difficult in these children population. Carvalho PH, Moura LB, Real Gabrielli MF, Cabrini Gabrielli MA, Antonio Pereira Filho V. Maxillary osteomyelitis associated with osteopetrosis: Systematic review. J Craniomaxillofac Surg 2018; 46:1905-10. Batra P, Shah N. Recalcitrant osteomyelitis following tooth extraction in a case of malignant osteopetrosis. Int Dent J 2004; 54:418-23. Jarineshin H, Fekrat F, Abadi MF. Anesthesia management of a child with osteopetrosis. Anesth Essays Res 2017;11:797-801. Burt N, Haynes GR, Bailey MK. Patients with malignant osteopetrosis are at high risk of anesthetic morbidity and mortality. Anesth Analg 1999;88:1292-7. Wong ML, Balkany TJ, Reeves J, Jafek BW. Head and neck manifestations of malignant osteopetrosis. Otolaryngology 1978;86:585-94.